Jung used the term 'persona' to mean the mask or facade that we present to the world. The 'persona'; is that version of the self, an image or picture of the self that we most want others to see and use as the basis for their interaction with us. The 'shadow'; is that part of the self that we do not want others to see. The 'shadow'; consists of all that is hidden, held away from public view and kept behind closed doors. We certainly don't want others and certainly not others in our professional lives, to see our doubts and confusions, our faults and failings. We don't expect to allow the world access to our fantasies and imaginings. At times, we want to deny that we even have them. So, there is much to hide, and energy to be expended in keeping it hidden. "[T]he persona may be counted among Jung's less abstruse and more practical conceptions. From the Latin word for an actor's mask, which in turn represents his role within the play, the persona, in the psychological meaning coined by Jung, is that part of the personality developed and used in our interactions, our conscious outer face, our social mask. Our persona may be a well-developed, socially adapted face--the famous writer, the devoted spouse, the rising young executive--or, on the contrary, a well-developed but socially unadapted face--the rebellious artist, the argumentative gadfly, the stubborn curmudgeon--but it is still the persona, a face and a role shown to others and used to give form to our outward sense of self." "Ego functioning is always, to some extent, overlaid with a certain amount of persona." "Lawyers in a corporate environment are to appear at work in navy-blue or dark-gray suits, as the colors brown and green are definitely 'out.' If a lawyer showed up at his corporate firm in a see-through cellophane suit and ponytail, his colleagues might have a difficult time taking him seriously as a 'big-time' corporate professional. When outfitted according to society's expectations, including adopting appropriate speech, body language and demeanor, he identifies himself and his status or position and facilitates professional relations with his boss, peers and clients. . . . Within the parameters of his specific occupational expectations, a person's individuality might be expressed by his choice of tie, his office furnishings, or where he takes clients to lunch, all of which make up his professional personality. His persona makes him plausible in the social role that he is playing." "While the persona is functioning well, many people identify with it. 'I am that,' they tell themselves. 'I am a doctor, or a school-teacher, or a radical socialist, or a rock musician, and I will let you know this even before you have a chance to exchange a word with me.'" "[T]here is ever present within the persona the danger of identifying oneself with the mask; or another way of saying that is identifying one's true self with the role that one fills. If this happens, the person thereby loses contact with the deeper sources of their own being and indeed life itself becomes one ongoing role-play behind which the person, the Self, disappears, and this results in a denial of the rest of the personality. One can sense this when it has happened, since there exists a peculiar state of deadness in people who have shriveled back and hidden behind their masks, a sort of psychological mummification." "[A]s long as the persona develops naturally, remains flexible, and is sufficiently differentiated for the individual to put on and take off at will, it is helpful. One has to distinguish between a persona which is stiff and formal, proof against all emotion, a sort of corset for face and behavior, and one which is under full conscious control, for use when needed. . . . [W]e must learn to recognize the difference between a persona developed and worn naturally and one which is unnatural, studied, and mechanical, either because it was chosen wrongly from the start and has never developed properly, or because, in the course of time, it has become one-sided, detached from the whole, and completely predictable." "The shadow is the unconscious side of the ego's operations of intending, willing, and defending. It is the backside of the ego, so to speak. Every ego has a shadow. This is unavoidable." "Everyone harbors within him an unconscious part of the personality which is unfriendly to himself." "[T]he shadow is not only the dark underside of the conscious personality. It has a bright side too: aspects of ourselves that might yet be lived out, our unlived life--talents and abilities that have long been buried or never been conscious." "For Jung, realization of the shadow was the Gesellenstuck, the journeyman's apprentice-work, a prerequisite for pursuit of the psychological life." "The secret is to discover a framework that invites and not suppresses the inferior elements, that transforms the forces of the nonrational. Otherwise, we will be destroyed by what we fall to comprehend." "The mask each person wears in society is based upon the pretence that the individual is identical with his culture (usually, with the 'best elements' of that culture). The fool, hiding behind the mask, is composed of individual deviance, which is deceitfully avoided, lied about, out of fear. This deviant, unlived life contains the worst and the best tendencies of the individual, suppressed by cultural opinion because they threaten the norm; forced underground by the individual himself, because they threaten personal short-term psychological stability (which means group identification and ongoing inhibition of fear)." "Just as any bright light must always cast darkness somewhere, the conscious brightness of the ego always casts a shadow in one's personality . . . .
Those unpleasant and immoral aspects of our selves which we would like to pretend do not exist or have no effect on our lives--our inferiorities, our unacceptable impulses, our shameful actions and wishes--the shadowy side of our personality is difficult and painful to admit. It contradicts who we would like to see ourselves as, who we would like to seem to be in the eyes of others. Our egoistic sense of self, our autonomy, our uprightness, senses its authority challenged by this shadow and feels the shadow's closeness as a threat, a dark brother/sister continually at our heels, awkward, nettling, anxiety-provoking, shameful. For this reason, Jung noted how this shadow and all its qualities often fall into unconsciousness or may even be actively, ruthlessly suppressed to maintain the sanctimonious sweetness of our illusory perfection. Unconsciousness, however does not rob the shadow of its existence or its power . . . . Indeed, Jung saw how this psychic shadow, when repressed or denied, continues to work behind the scenes, causing all manner of neurotic and compulsive behavior." 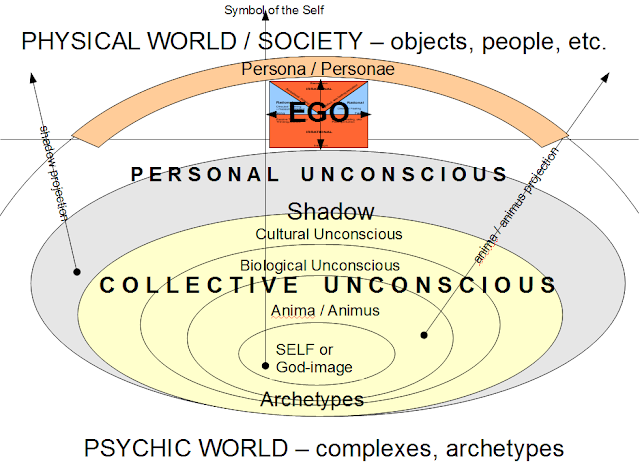 "[For Jung, the] shadow is an inferior personality that has its own contents, such as autonomous thought, ideas, images, and value judgments . . . .
Today, the term 'shadow' indicates that part of the unconscious psyche that is thought to be nearest to consciousness, even through it is not completely accepted by it. Because it is contrary to our chosen conscious attitude, the shadow personality is denied expression in life and coalesces into a relatively separate personality in the unconscious, where it is isolated from exposure and discovery. For Jung . . . psychotherapy offers a ritual for transformation and renewal in which the shadow personality can be brought to awareness and assimilated. . . . 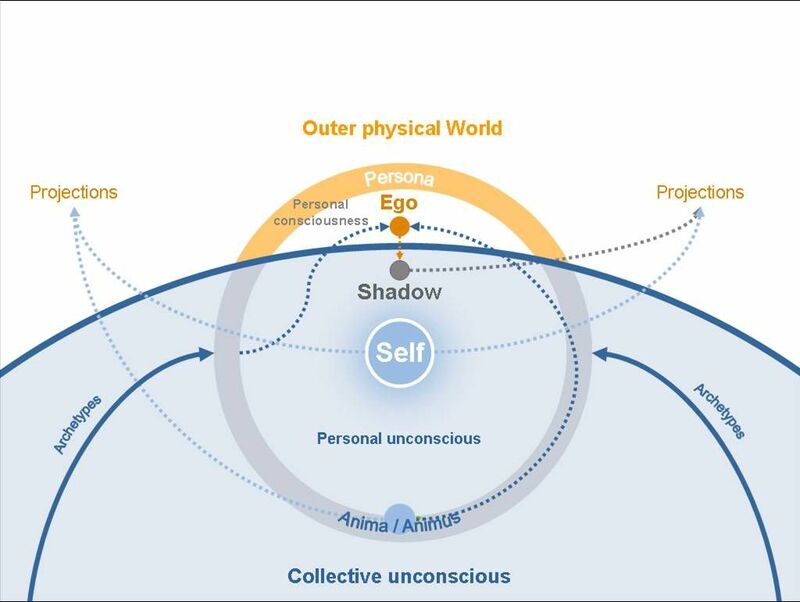 Shadow integration means developing the capacity to carry an expanded and more unified awareness, enabling us to reduce the shadow's inhibiting or destructive potentials and to release trapped, positive life energies that may be caught in the pretense and posturing required to conceal the shadow." "[It is common to find an] identity with the persona, which is the individual’s system of adaptation to, or the manner he assumes in dealing with, the world. Every calling or profession, for example, has its own characteristic persona. . . . A certain kind of behaviour is forced on them by the world, and professional people endeavour to come up to these expectations. Only, the danger is that they become identical with their personas--the professor with his text-book, the tenor with his voice. Then the damage is done; henceforth he lives exclusively against the background of his own biography. . . . One could say, with a little exaggeration, that the persona is that which in reality one is not, but which oneself as well as others think one is. In any case the temptation to be what one seems to be is great, because the persona is usually rewarded in cash." "The persona is a complicated system of relations between individual consciousness and society, fittingly enough a kind of mask, designed on the one hand to make a definite impression upon others, and, on the other, to conceal the true nature of the individual." "It is in the nature of the conscious mind to concentrate on relatively few contents and to raise them to the highest pitch of clarity. A necessary result and precondition is the exclusion of other potential contents of consciousness. The exclusion is bound to bring about a certain one-sideness of the conscious contents. Since the differentiated consciousness of civilized man has been granted an effective instrument for the practical realization of its contents through the dynamics of his will, there is all the more danger, the more he trains his will, of his getting lost in one-sidedness and deviating further and further from the laws and roots of his being." "When we analyse the person we strip off the mask, and discover that what seemed to be individual is at bottom collective; in other words, that the persona was only a mask of the collective psyche. Fundamentally the persona is nothing real: it is a compromise between individual and society as to what a man should appear to be. He takes a name, earns a title, exercises a function, he is this or that. In a certain sense all this is real, yet in relation to the essential individuality of the person concerned it is only a secondary reality, a compromise formation, in making which others often have a greater share than he. The persona is a semblance, a two-dimensional reality, to give it a nickname. It would be wrong to leave the matter as it stands without at the same time recognizing that there is, after all, something individual in the peculiar choice and delineation of the persona, and that despite the exclusive identity of the ego-consciousness with the persona the unconscious self, one’s real individuality, is always present and makes itself felt indirectly if not directly. Although the ego-consciousness is at first identical with the persona—that compromise role in which we parade before the community—yet the unconscious self can never be repressed to the point of extinction. Its influence is chiefly manifest in the special nature of the contrasting and compensating contents of the unconscious. The purely personal attitude of the conscious mind evokes reactions on the part of the unconscious, and these, together with personal repressions, contain the seeds of individual development in the guise of collective fantasies." "To become conscious of [the shadow] involves recognizing the dark aspects of the personality as present and real. This act is the essential condition for any kind of self-knowledge, and it therefore, as a rule, meets with considerable resistance. . . .
Closer examination of the dark characteristics—that is, the inferiorities constituting the shadow—reveals that they have an emotional nature, a kind of autonomy, and accordingly an obsessive or, better, possessive quality. . . .
[W]ith insight . . . the shadow can to some extent be assimilated into the conscious personality . . . ."
"Most people are too indolent to think deeply about even those . . . aspects of their behavior of which they are conscious; they are certainly too lazy to consider how the unconscious affects them." You Can't Please People. Stand for Yourself!